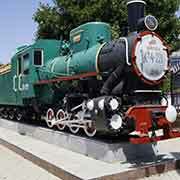 Shkoda, a steam locomotives used in 1949, at the Museum of Railway Technics, near the central station of Tashkent. It was opened in 1989, in honour of the railroad centenary in Uzbekistan. These are the relics of Soviet days.